Looking for a better way to help your aging parent maintain their lifestyle? 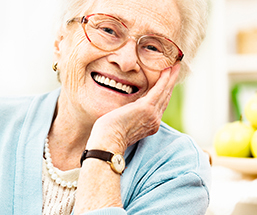 SameAddress provides the most comprehensive In Home Care and Concierge Services that enable safe, comfortable and independent living for older adults who choose to age at home. Could Mom use an extra hand around the house? SameAddress provides instant access to a comprehensive range of Concierge Services that help with anything from grocery shopping to home repairs to restaurant recommendations. Does Dad require personal care at home? SameAddress defines custom In Home Care plans that make it possible for him to age safely and comfortably at home, providing dependent support and visibility into the home no matter how critical the situation. Connect them to everything they need, at the touch of a button. SameAddress offers the One-Source Concierge Button, putting access to over 30 personalized services for aging adults, at their fingertips. At the touch of a button, gain access to health care management, professional in-home services, 24/7/365 emergency response, as well as a full range of daily senior living support options. Questions or concerns about care for an aging parent? Our licensed nurse and certified Aging In Place Advisor answers all your questions about aging in place. We visit the homes of older adults to assess their living situation and develop a personalized care plan that meets both their needs and their budget.